1. G.O.Ms.No.33, Education (SE-Ser.III) Department, dated 02-5-2013 read with G.O.Ms.No.34, Education (SE-Ser.III) Department, dated 03-5-2013. 2. G O. Ms. No.15 Higher Education (TE) Department, dated 23-4-2015. 3. G.O. Ms. No.11, School Education (Ser.II) Department, dated 15-6-2015. 4. From the Director of School Education, Telangana, Hyderabad, Lr.Rc.No.Tans/Ser.IV-2/2015, dated 12.6.2015. In order to facilitate and regulate the transfers of Head Masters, Grade II (Gazetted) and Teachers working in Government / ZPP / MPP Schools, Government of Telangana have decided to issue the Rules relating to transfers. 2. In the G.O. 3rd read above, Orders were issued for rationalisation of posts and staff in Government, ZPP and MPP Schools. 4. In exercise of the powers conferred by Section 78 and 99 of Telangana Education Act, 1982 and under Article 309 of the Constitution of India and in supersession of all the earlier Rules and Guidelines on Transfer of Teachers, the Government of Telangana hereby makes the following Rules regulating the transfers of the categories of Head Masters Gr.II (Gazetted), School Assistants and S.G.T.s and their equivalent categories working in the Government Schools and Z.P.P. and MPP Schools in the State of Telangana. 1) These Rules shall be called the Telangana Teachers (Regulation of Transfers) Rules, 2015. 2) These Rules shall be applicable to Head Master, Gr.-II (Gazetted), School Assistants / SGTs and other equivalent categories working in Govt /Zilla Parishad/MPP Schools in the State of Telangana, herein after referred to as Teacher in these Rules. All transfers shall be made by way of counseling through Transfer Committees constituted for each district / zone. The Director of School Education, Telangana, Hyderabad shall draw the Schedule and communicate the same to the competent authorities for affecting transfers from time to time. The appointing authority concerned shall issue transfer and posting orders based on the recommendation of the Committee constituted for this purpose. 1) The following categories of Head Master, Gr.II (Gazetted)/ Teacher in the Government/ ZPP /MPP shall be transferred. (a) Head Master Gr.II (Gazetted), who have completed (5) years of service in a particular School as on 1st July of the current year shall be compulsorily transferred, provided those who are going to retire within two years from 1st July of the current year shall not be shifted until and unless the incumbent requests for such transfer. 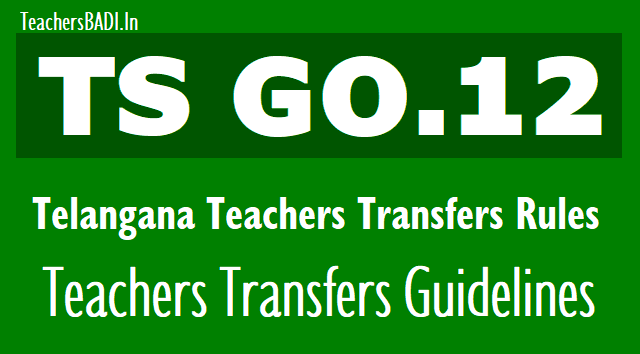 (b) Teachers, who have completed (8) years service in a particular school as on 1st July of the current year shall be compulsorily transferred, provided those who are going to retire within two years from 1st July of the current year shall not be shifted until and unless the incumbent requests for such transfer. (c) The male Head Master Grade-II (Gazetted) /Teacher aged below 50 years as on 1st July of current year and working in Girls High School. (d) The Head Master Grade-II (Gazetted) and the Subject Teacher concerned of the school in which the pass percentage in the S.S.C. Public Exam (March) is less than 25% shall be transferred to the schools located in Category-III / IV habitations. However, for want of Subject Teachers if the result is below 25%, the Head Master concerned shall not be made accountable and hence shall not be shifted. The Transfer Committee constituted should take up such transfers on first instance without reference to general transfer or entitlement points of the individuals. 3) Head Master Gr.II (Gazetted) / Teacher who has completed a minimum period of two years service in a category of post in a School as on 1st July of the current year shall be eligible to apply for transfer. 4) The Head Masters Gr. II (Gazetted) / Teachers shifted under Rationalization i.e., Primary Schools, Upper Primary Schools and High Schools shall also participate in the Transfers Counseling, provided those who are going to retire within two years from 1st July of the current year shall not be shifted until and unless the incumbent requests for such Transfer and next junior shall be shifted. If other junior Teacher is not available he/she shall be shifted. 5) The Head Masters, Gr.II (Gazetted) who has completed (5) year of service and Teacher who has completed (8) years of service as NCC Officer, shall be posted in a vacancy in a School where there is NCC unit. 6) All transfers shall be affected within the present Management, Agency Area to Agency Area, Plain Area to Plain Area. i. Service in category IV areas: Five (5) points for every year of service and 0.416 for every month. ii. Service in Category III areas: Three (3) points for every year of service and 0.25 for every completed month. iv. Category-IV: All Habitations / Towns where 12 % HRA is admissible , and which do not have connectivity through an all weather road as per the norms of the Panchayath Raj ( Engineering) Department. The District Collector shall publish the list of habitations in the district which do not have connectivity through all weather road as per the norms of Panchayath Raj ( Engineering ) Department in consultation with the Superintendent Engineer, P.R. of the district for this purpose, and the same shall be final. (b) For the Service rendered: 0.041 point for every one month of the completed service in the total service in all categories as on 1st July of the current year. a. The President and General Secretary of the Teachers' Associations having OD facility in terms G.O.Rt.No.1410, G.A.D. (Ser.Welfare) dated 20-05-2015 at the State and District Levels are eligible for ten (10) points. b. Ten (10) points for un-married Head Mistress, Gr-II / Female Teacher. c. Ten (10) points for Head Master Gr.II (Gazetted) / Teacher, whose spouse is working in State Government or Central Government or Public Sector undertaking or Local Body or Aided Institution in the same District and opted for transfer nearer to and towards the place of working of his/her spouse, benefit of spouse points shall be applicable to the Head Master Gr.II (Gazetted) once in (5) years and Teachers once in (8) years. An entry shall be made in this regard in the Service Book. A copy of the Certificate issued by the competent authority shall be enclosed to the check list to consider cases under this category. (a) For the Teachers who are affected by rationalization process they are eligible for 10 points extra over and above already secured. The Teachers who have completed (8) years service are not eligible for 10 points extra over and above already secured. (b) The Teachers who were transferred during counseling 2013 and could not be relieved for want of substitute shall be relieved forthwith if posts exist after rationalization. If post does not exist after rationalization, he/she shall participate in transfer counseling and is entitled for (5) additional points. IV. In case the entitlement points of two or more applicants are equal, the inter-se seniority shall be determined as below. i. Applicants having disability of more than 40% but less than 70% (Visually challenged/ Ortho-handicap/ Hearing Impaired) shall take priority. a) The Teachers who have got National award issued by the Central Government will get (15) and who have got State award issued by the State Government will get (10) points respectively . He/she is eligible for only one category whichever is highest. State level – 5 points. District level – 4 points. Provided that they should enclose a Certificate issued by the District Educational Officer in respect of State and District level trainings and Project Officer, RVM in respect of Mandal level trainings. a. Physically handicapped i.e., those with not less than 70% Visually challenged / ortho-handicap./ Hearing Impaired has to produce SADAREM Certificate or Medical Board certificate. f. Applicants’ Children suffering with holes in the heart by birth and undergoing medical treatment available only at specified places to which they are seeking transfers. g. Applicants with dependant children suffering from Juvenile Diabetes. For the purpose of (d, e and f) above, a copy of the Certificate issued by a competent authority i.e., District Medical Board / State Medical Board should be enclosed to the application for consideration of preferential categories. The Head Master, Gr.II (Gazetted) should avail either the preferential category (Rule 8) or the special points (Rule 6 (II) (c) once in (5) years, and Teachers should avail either the preferential category (Rule 8) or the special points (Rule 6 (II) (c) once in (8) years, and an entry be made in the Service Book. The Teachers who have availed the preferential category or spouse category in the earlier transfer counseling and now shifted under Rationalization without completion of (8) years of service shall be given the respective benefits / entitlement points along with the Rationalization points. 1) The following vacancies shall be notified for the purpose of counseling. d) Resultant vacancies arising during Counseling. Rule 10. Publication of vacancies and seniority list. ii) The School wise vacancy position of Head Master Gr.II (Gazetted) / School Assistant / Secondary Grade Teacher and equivalent categories for counseling. (2) below, the list of names of the Head Master, Gr.II (Gazetted) / Teacher who applied for transfer with entitlement points. 2) After the last date for applying for transfers as per Schedule, the seniority list shall be prepared, using software for generating the entitlement points, management wise, category wise, subject wise, medium wise (except Languages) and the seniority list with entitlement points shall be published in the website specified for the purpose and also on the notice board of District Educational Office / Regional Joint Director of School Education Office. 1) The Head Master Gr.II (Gazetted) / Teacher who is eligible as per the criteria prescribed in Rule 5 shall apply online through website specified for the purpose in the prescribed proforma and the particulars furnished in the proforma shall be final and no modification shall be allowed. 2) The applicants shall thereafter obtain the printout of the application from the specified website and submit the same duly signed to their respective authorities, viz., Mandal Educational Officer/Head Master High School / Deputy Educational Officer, as the case may be. 3) An applicant seeking to apply under Preferential categories / spouse category shall also submit along with application the latest Certificate from the competent authority in that regard. 4) If any Head Master, Gr.II (Gazetted) / Teacher who is compulsorily transferable under Rule 5 does not apply online or having applied does not attend the counseling (physical or online), he/she will be transferred to the available left over needy vacancies. 1) Objections if any in respect of the seniority list and entitlement points published as per Rule 10(2) may be filed online or in writing before the District Educational Officer / Regional Joint Director of School Education, as the case may be, by any applicant together with evidence in support of such objection within the time specified for this purpose in the Schedule. 2) The District Educational Officer / Regional Joint Director of School Education, as the case may be, shall cause verification of all objections and pass orders disposing of the same. In cases where objections are upheld, the District Educational Officer/ Regional Joint Director of School Education shall cause the necessary corrections in the seniority list and publish the same on the website. ii. The Committee shall be the competent authority for transfer of all Head Master Gr.II (Gazetted) in the Government High Schools in the respective Zone. The transfer shall be affected within the Zone by way of counseling. iii. The Regional Joint Director of School Education concerned shall be the competent authority to issue transfer and posting orders of the Head Masters Gr.II (Gazetted) working in Government High Schools, after the approval by the Committee. i. The Committee shall be the competent authority for transfer of all Head Master Gr.II (Gazetted) in the ZP High Schools in the District. The District Educational Officer concerned shall be competent authority to issue transfer orders to all the Teachers working in the Government Schools and ZPP / MPP Schools after the approval by the Committee. 1) Based on the recommendations of the respective Committees, the appointing authorities concerned shall issue posting orders on the same day to all the HMs / Teachers. Individual transfer Orders shall be issued. 2) The Teacher / HM who are to be compulsorily transferred and who do not attend for counselling, shall be given posting orders in absentia for the left over required vacancies at the end of the counseling of that particular category of Teachers, in the presence of the Committee and in the counseling hall without fail. 4) Once transfer orders are issued by the competent authority with the approval of the Committee, review or modification of the Orders shall not be considered, either by the Committee or by the competent authority. 5) In all the orders of the transfer the condition is to be included that the orders shall be subject to outcome of SLP in Supreme Court of India and other pending cases. 6) The transfers affected shall be displayed on website and also at the office of Regional Joint Director of School Education, District Educational Officer and ZP after completion of counseling. 2) A Head Master Gr.II (Gazetted) / Teacher who does not so join cannot claim compulsory wait under any circumstances for any reason. 3) The Teachers who have any grievance on the transfer counseling should avail all levels of appeal provisions before going for other legal remedies. 1) The Director of School Education may either suo-moto or on an application received from any person aggrieved by the orders of the Transfer Committee may call for and examine the records in respect of any proceedings of transfer to satisfy himself about its regularity, legality or propriety. If, in any case, it appears to him that any such proceedings should be revised, modified, annulled or reversed or remitted for reconsideration, he may pass orders accordingly or remand the case with any direction so as to rectify any violation of rules or discrepancy. Such orders shall be implemented by the authority concerned. 2) The Director of School Education may stay the implementation of any such proceedings, pending exercise of its powers under sub-rule (1) above. 2) The Member-Secretary who has issued orders in violation of these rules or instructions issued by Director of School Education from time to time in the matter shall be liable for disciplinary action as per rules.